shortly before the sun rises each morning, plump zucchini buds unfurl to greet the day. it is a magical sight, if you happen to be awake at such ridiculous times. 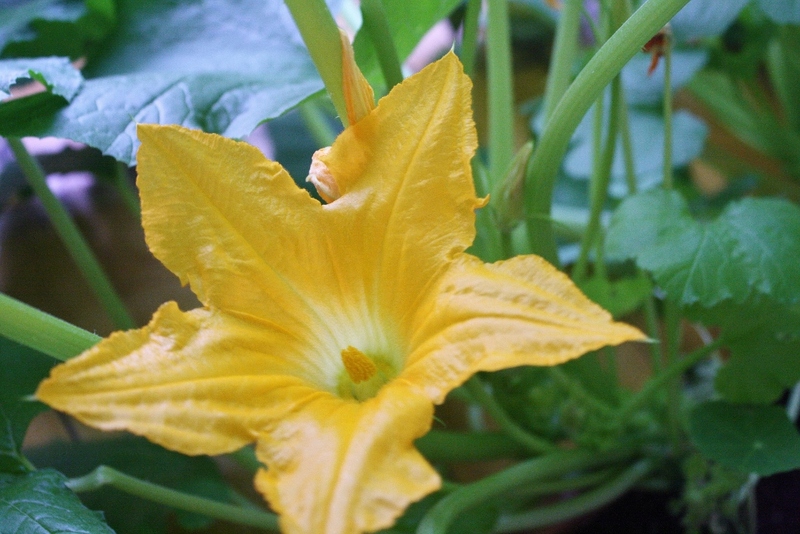 if you happen to have planted your squashes outdoors, you can just sit back and let nature do the pollinating. however, if you are crazy enough to be growing them indoors, then you have the choice of either capturing bees and setting them free in your home, or grabbing a small paintbrush and doing the job yourself. it should be noted that the bee population is pretty healthy here in Montreal, so much so that my favorite animator purchased a jar of honey back at the start of the winter that was collected and bottled according to different areas of the city. this batch is from Notre-Dame-de-Grâce (our neighborhood) and Westmount (the adjoining neighborhood). the intent was to provide some controlled inoculation against the constellation of pollen in our area—the old 'hair of the dog' approach—in hopes of reducing my pollen-nightmare come summer. 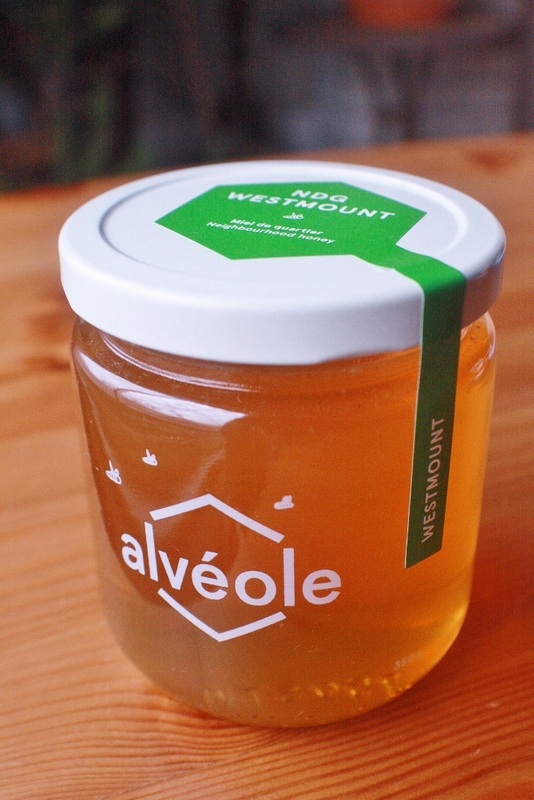 while i like that idea and generally support the consumption of local honey, keeping a hive of bees in my apartment might be taking things a bit too far. now, as you may recall from biology class, some flowers reproduce sexually, which mans you have to have to get the male stuff in contact with female stuff. with some plants—tomatoes, for example—each flower contains all the necessary parts to get the job done. you can fertilize tomatoes indoors by either turning a gentle fan on the plants or giving the plants a light shake daily to encourage pollen mobility. however, with plants like squash, there are separate male and female flowers, so you have to get a bit more... uhm... invasive. the idea is to mimic the action of bees traveling from plant to plant. find a male flower and remove some pollen using a small brush, cotton swab, or your finger (make sure the plant consents before trying that last one), then pass that pollen along from one female flower to another. 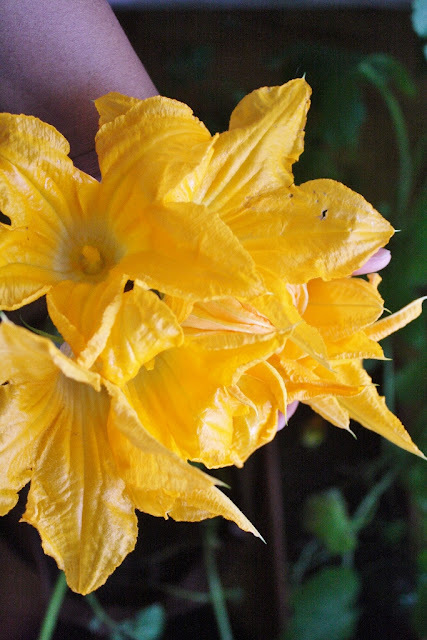 some people prefer to remove a male flower from the plant, tear off the petals to reveal the stamen (the pointy bit in the middle of a squash blossom), and use that to directly transfer pollen to the female flowers. i will refrain from finding any metaphors in that process, but that is the long and the short of the thing. seems simple enough, right? 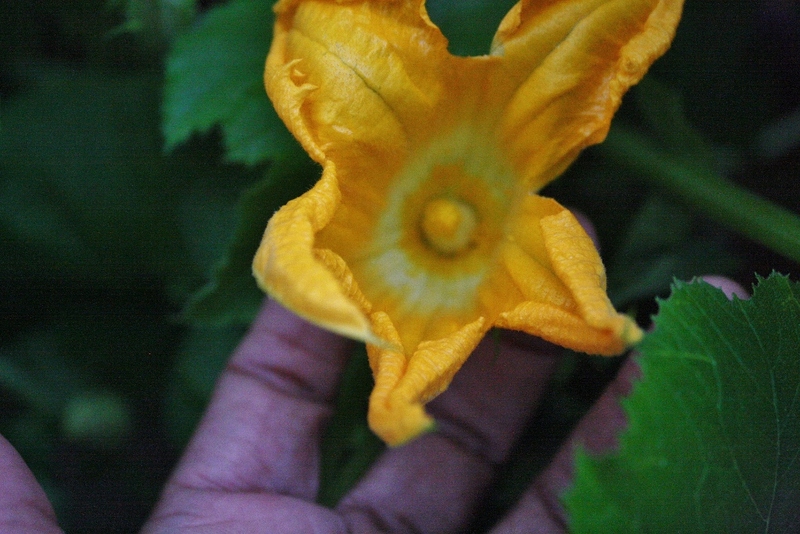 except, the whole sexual reproduction thing only works if you have both male and female zucchini flowers on your plants. between my four plants, there have been more than thirty large blossoms in the last week alone... every single one of them was male! the female flower is distinct in that the stalks tend to be much shorter and there is usually a teeny-tiny zucchini at the base of the bloom, which grows larger after it is properly fertilized. all i have gotten so far are long stems and stamens... so many stamens. for a few days, i grabbed my paintbrush every morning and went through the whole routine, until i finally gave up and accepted that there were no female flowers in sight. it was quite amusing. me: i don't think i have seen a single female flower yet on these plants. him: but i thought you were pollinating them every morning. me: i thought so too, but there is nothing to pollinate. him: so you've just been rubbing their little pimpeks together? me: some plants like that sort of thing. at which point, we both erupted into indescribable laughter, which tends to happen quite a lot around here. it is not unusual for squash plants to produce male flowers before the female flowers begin to emerge, and there are still tons of tiny buds waiting to develop, so i have not given up hope. however, there i was with many blossoms that open for just a few hours (at the crack of dawn mind you, so that if you sleep in late, you will miss the whole thing) before wilting and eventually falling off the plant. what a waste, no? well, actually... no. they are totally edible, raw or cooked, and delicious to boot! i tend to prefer them sauteed very briefly with a bit of garlic and olive oil, but as my favorite animator is new to this delicacy, he got to pick the cooking method. i attempted to expose him to the culinary potentials, but he saw a photo of tempura-style fried flowers, and that was it. i collected all the opened blossoms (plus a couple from the previous day that had wilted, but not yet dried out). they can be stored in the refrigerator for up to one day (though they will look pretty sad by that point). i dunked them individually into a bowl of cold water and stored them atop a barely-damp paper towel in a covered plastic container. that is just enough moisture to prolong wilting, but you do not want them sitting in a puddle of water). 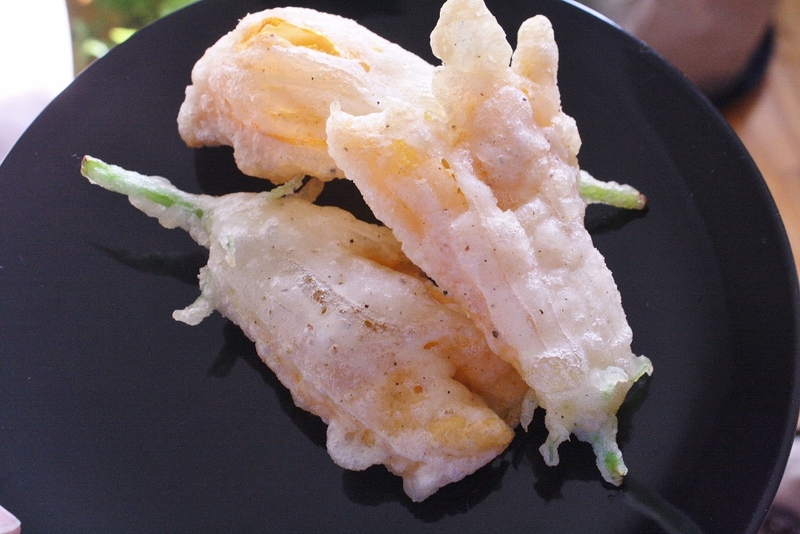 then i made a crazy-simple mixture of flour, soda water, sea salt, black pepper, and a pinch of yeast (which i added because i like the fermenty taste, but i had no beer on hand to use instead of soda water), then battered and fried the flowers. 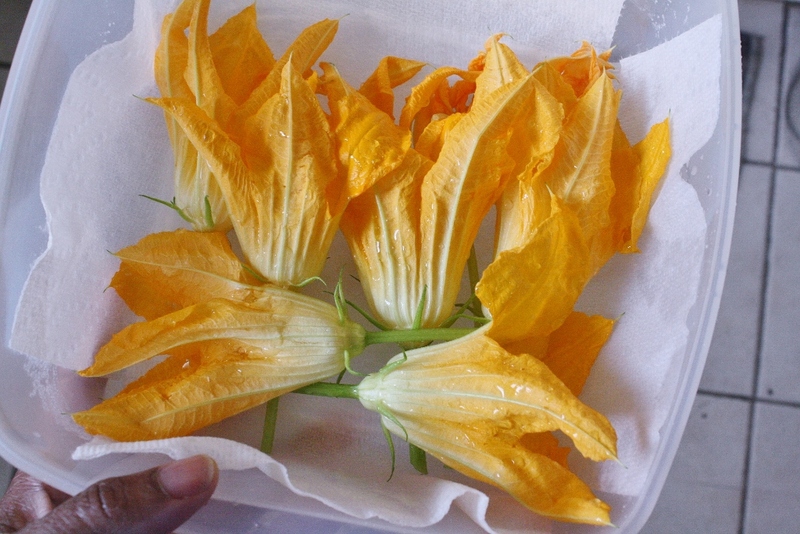 you can probably hold your breath for longer than it takes to cook zucchini blossoms. it really is that easy. we had them as is, and it was declared a success... which probably means that we will be eating this many more times in the near future.